Back in March, I explained why I sold my position in Tesco for a 22% loss. Looks like it was the right move. As of this writing, the stock is down another 25% from my selling price. Worse, the company recently reduced its interim dividend by 75%. By no means was I the first to highlight trouble at Tesco and plenty of observers have offered reasons for the company's decline. My focus here will be on the dividend. Frankly, I'm still a bit stunned at how Tesco's turned out and think its dividend cut serves an important case study for dividend investors to review. Consider that in fiscal year 2011 (year-end February 2011) Tesco increased its dividend by 10.8% -- marking an impressive 27 consecutive years of dividend increases. Well-respected long-term investors like Neil Woodford and Warren Buffett held considerable positions in Tesco and its UK market share was over 30%. All seemed to be right. The board and management also appear to have been very confident in the future of the business, otherwise they wouldn't have increased the dividend at such a high rate in fiscal 2011. With the exception of a financial crisis-scenario, rarely does a company have such a sharp reversal in dividend policy. Yet that's exactly what happened at Tesco. In fiscal year 2012, the dividend grew just 2.1%. The next year, it was held flat and stayed at that rate until it was finally cut in August 2014. The company's dividend health, as measured by the Dividend Compass, was also deteriorating. While some warning signs were present, the combination of Tesco's distinguished dividend track record, its real estate holdings, and its leading share of the UK grocery market remained for some compelling reasons to hold and hope for a dividend turnaround. Yet the numbers didn't lie. Tesco's dividend health slowly worsened, the dividend yield steadily increased to more than twice the UK market average (usually a good sign that something's wrong), and it was only a matter of time before the board needed to make some tough decisions. The first takeaway from Tesco's dividend cut is a reminder that no dividend is risk-less or sacrosanct. In the UK market, Tesco was a core holding in many dividend portfolios (including mine for a while) and up until a few years ago its payout was about as much of a sure thing as one could expect. Yet in a matter of three years Tesco went from dividend aristocrat to dividend plebian. If worse comes to worse, the board can always cut the company's dividend. Second, it's critical to not "buy and forget" your investments. I know some well-intentioned dividend strategies advocate this approach and while I certainly appreciate the value of patience and keeping trading costs to a minimum, what happened with Tesco serves as an example of why some level of maintenance research is needed if you hope to avoid dividend cuts. The combination of a permanent capital loss and a dividend cut can have a material impact on your longer-term income returns and you'll have less capital to reinvest in another dividend-paying stock. If you can catch a dividend cut early, you have much higher odds of preserving more of your capital. 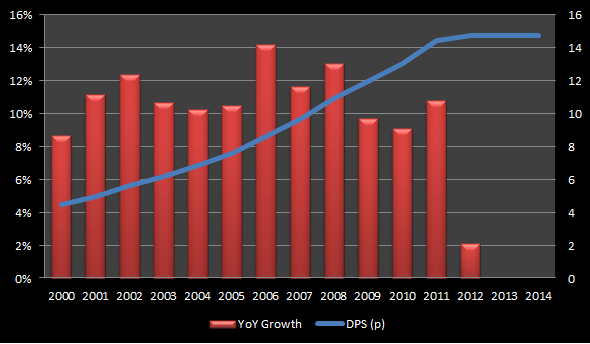 Third, no matter how strong the company's dividend track record, if the numbers don't add up, it pays to be skeptical. Admittedly, I held onto Tesco a little too long thinking that it would simply take some time for the company to right the ship. When in doubt, preserve capital. Fourth, while most dividend-focused portfolios are diversified, the Tesco share price decline and dividend cut is a reminder that it's important not to rely on any one stock (or one sector) to generate a large percentage of your dividend income. Finally, even if you're a patient investor, it's important to establish some selling rules. For example, one rule might be that if a company's dividend growth trajectory radically changes for the worse or is altogether halted, it's time to sell. In such a situation, it's highly likely that company leaders have changed their opinion about the company's ability to generate higher levels of cash flow.